In a strategy some Western diplomats admit could badly backfire, the Bush administration has made clear it wishes to continue to support Mr Musharraf even after Monday’s election in which the Pakistani public delivered a resounding rejection of his policies…. Perhaps none of this should be all that surprising, given that both Bush and McCain have been wildly wrong about Pakistan at just about every turn. Still, after an election in which the Pakistani people are experiencing a profound “moment of hope,” having turned out in apparently record numbers to give Musharraf and his backers an anti-incumbent thumping unlike anything seen in Pakistan’s history, Bush and McCain seem to lack a grip on reality as they continue to stand by their man so obstinately. Pakistan’s leading politicians have treated the Bush administration’s efforts to plead Musharraf’s case as the punch line to a bad joke, agreeing to form a coalition government that doesn’t include any lingering remnants of Musharraf’s party, as Washington would have preferred. Reports indicate that the framework underlying the new coalition government will be a revived version of the Charter of Democracy, a preconstitutional declaration signed by Nawaz Sharif and Benazir Bhutto on behalf of their parties in 2006 (and about which I’ve written previously). The Charter — which, among other things, pledges to restore the Pakistan Constitution to its pre-Musharraf state and proscribes its civilian signatories from seeking military support for partisan political advantage — was almost rendered a nullity by the Bush administration’s efforts to broker a deal between then-army chief Musharraf and Bhutto. With an agreement between the major political parties for its revival, however, the prospects for rolling back the legal and institutional damage wrought by Musharraf’s Emergency may now be considerably increased. What would rollback entail? Personality-driven media reports in the United States have emphasized the possibility of impeaching and removing Musharraf from office. 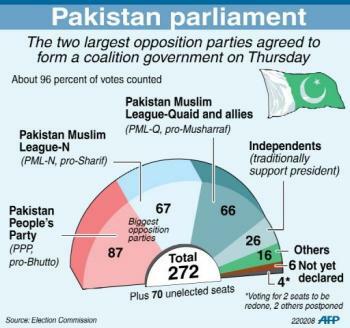 Such a move — which might be understood to implicitly concede the legitimacy of Musharraf’s highly contested reelection as president — would require a two-thirds majority vote in the National Assembly, which the coalition may or may not attain, and sufficient support in the Senate, which remains stacked with Musharraf supporters. However, in speculating about impeachment, these news reports seem to have the math of rollback precisely backwards. 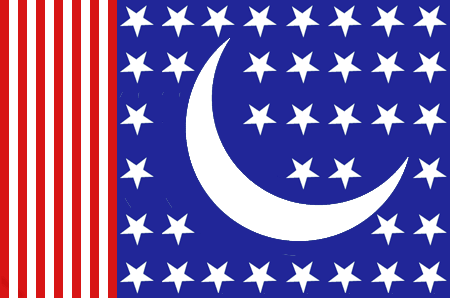 Far from being a “legitimately elected” president, as McCain would have it, Musharraf’s suspension of the Constitution in November “by use of force or show of force or by other unconstitutional means” has rendered him potentially guilty of “high treason” under Article 6 of the Pakistan Constitution. In the past, Pakistani coup leaders (including Musharraf himself after his first coup) have avoided prosecution for treason by strongarming the incoming parliament into amending the Constitution specifically to indemnify their extraconstitutional actions — an act which itself requires a two-thirds vote. 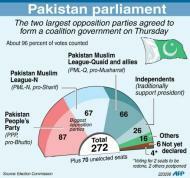 Musharraf’s opponents, therefore, do not need two-thirds support in parliament to resist him. Rather, it is Musharraf himself who needs two-thirds support from parliament to avoid the possibility of being charged with treason. In a parliament now dominated by Musharraf opponents, that indemnification obviously will not be forthcoming, although it is possible that the parliament would be willing to indemnify him in exchange for his resignation or other concessions. The only thing potentially standing between Musharraf and a treason prosecution, other than the exercise of prosecutorial discretion, is his own unilateral order purporting to indemnify himself. That decree is of highly questionable legality, but if the new parliament nullifies the many laws and constitutional amendments that Musharraf tried to decree during the Emergency, then that order would in any event be swept away as well. (Indeed, the Charter of Democracy pledges to go even further by rolling back Musharraf’s earlier constitutional amendments, some of which grabbed power for the presidency and the army at the expense of parliament and the prime minister.) Moreover, if the new parliament restores judicial independence, by reinstating the approximately 60 judges who refused to swear loyalty to Musharraf in November, then it is unlikely that the Pakistan Supreme Court would uphold Musharraf’s attempt at self-indemnification. (Most notable among these judges, of course, is Chief Justice Iftikhar Muhammad Chaudhry, whom Musharraf, carrying himself in a highly presidential manner, recently called “the scum of the earth, a third-rate man, a corrupt man” in an interview with Jemima Khan.) A restored Supreme Court might even invalidate Musharraf’s reelection as president, as it apparently had been poised to do on the eve of his crackdown in November. Math aside, how far the new government will be able and willing to go in directly confronting Musharraf remains unclear. The extent to which the Pakistan Army will back Musharraf in any constitutional confrontation also remains somewhat uncertain. 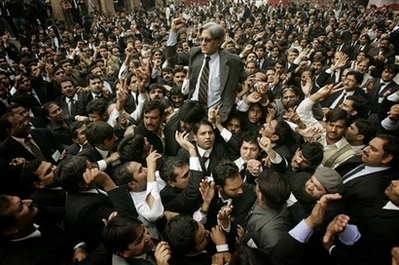 Ahsan and the lawyers’ movement have called on the new parliament to restore the ousted judges before March 9th, the one-year anniversary of Musharraf’s initial attempt to oust Chaudhry, and have indicated that they will conduct a “long march” to Islamabad if that doesn’t happen.